Sunday Photo; Buddha Nature – Wake Up and Laugh! Our Buddha nature is like a light in a house. Even if you close all the doors and cover all the windows, some light still shines through to the outside. That’s how we know Buddha-nature is there. 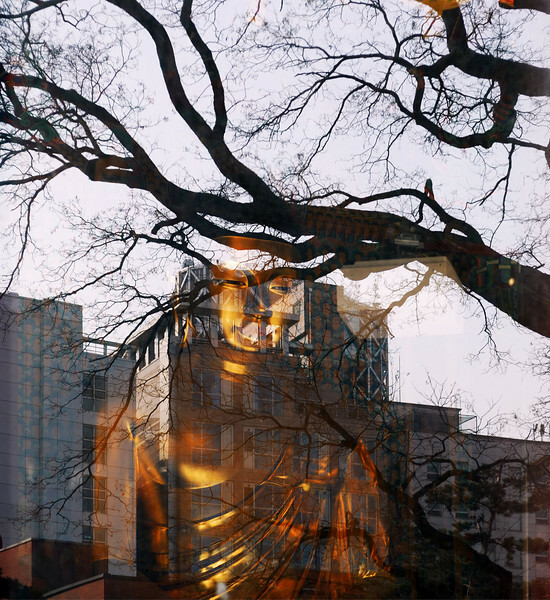 This photo looks like a double exposure, but it was taken through the huge glass window that covers the front entrance of the Dharma Hall at Jogyesa during Winter time. The light shining off the massive gold Buddha is just enough to shine through the reflection of the tree and buildings, just like our Buddha-nature. oh, this picture is really marvellous. I am deeply touched, Joseph…! Have you all a very beautiful and peaceful day! I was trying for something similar after the morning ceremony at our center in Bangkok. that’s really nice in the alter! I like the dark space too. It really looks great with the wooden floor also in the frame, but then the reflection is kind of lost. 어제 저녁 과학원에서 만난 보살입니다.